1. If You Pay Extra Money For A View Is It Protectable? neighbors or the City or their HOA because they have “lost their view” due to construction on a neighboring lot or the neighbor’s trees have grown like weeds. Almost without question the aggrieved party feels strongly that they paid for this view and it’s a protectable right under California law. Conclusion: Before you have your clients shell out big bucks to buy into that perpetual view that they are paying extra for familiarize yourself with these cases. If the subject property is not located in one of those handful of cities that has a view or tree ordinance or an HOA who has view restrictions in the CC&Rs be prepared to punt on questions dealing with the ability of the buyer to enforce views if the neighbor impairs their view. Always pass on that type of question to an attorney and, even better, put it in writing that you cannot give legal advise, consult an attorney. Scott Souders is a real estate attorney who has practiced real estate law in excess of 42 years in Southern California. Copyright © 2019 Law Office Of J. Scott Souders, All rights reserved. Advertising Requirements Using “Team Names”. Business and Professions Code Sections 10159.5 through 10159.7 governs the use of a “team name” and a fictitious business name in real estate sales advertising. Those provisions require a responsible broker’s name to be displayed as prominently and conspicuously as a team name in all advertising and defined such terms as “team name”, “responsible broker’s identity” and “fictitious business name”. Effective August 29, 2016, chapter 224 revises the definition of “responsible broker’s identity” to mean either (1) the name under which the responsible broker is currently licensed; or (2) both that name and the associated license number. This bill was enacted to correct a drafting error that previously required listing both the name and license number of the responsible broker when the intent was to require one or the other, but not both. Under Business and Professions Code 10161.8 brokers are required to immediately notify the BRE whenever they employ, or terminate the employment of, a real estate salesperson. A willful or knowing violation of this law is a crime punishable as a misdemeanor. Effective January 1, 2018, Business and Professions Code 10161.8 requires brokers to state whether the newly hired salesperson is an associate licensee and, if the associate licensee is a broker, to identify each responsible broker with whom the licensee is contractually associated. Under Business and Professions Code 10140.6 licensees are required to disclose certain information, including their license numbers on all advertising materials intended to the first point of contact with consumers and on Real Property Purchase Agreements. Under current law these disclosure requirements do not apply to “for sale” signs or to advertisements in print or electronic media. Effective January 1, 2018, Business and Professions Code 10140.6 will require the licensee’s name and the responsible broker’s identity to be included in those solicitation materials and Purchase Agreements. Also beginning in 2018 the disclosure requirements under Business and Professions Code 10140.6 will apply to (1) printed and electronic advertisements; (2) for sale, for rent, for lease and open house signs as well as directional signs. Comment: No doubt this law was pushed by the lobbyist for the sign industry. The Davis Sterling Act, Civil Code Sections 4000 to 6150 requires HOAs to maintain the common areas including repairing damage caused by wood destroying pests such as termites. Under CC 4785 the HOAs may require an occupant to temporarily vacate the unit in order to apply pesticide. The HOA much give at least 15 days advance notice of the need to temporarily vacate to the occupants and the owners. Under CC 1940.8.5 landlords must notify tenants before they can apply pesticide to a unit or the common area. The notice must contain specific information about the targeted pests and the pesticide to be applied among other details. Foreclosing After Death of Owner. Civil Code Section 2920.7 was recently enacted in 2016 which prohibits a lender from foreclosing once they have been notified that the borrower has died. The lender cannot record a Notice of Default until (1) requesting reasonable documentation of the borrower’s death from the claimant; (2) give the claimant at least 30 days to provide that documentation, Civil Code 2920.7(a). The servicer must also provide the claimant with certain information about the loan and must allow the claimant to apply to assume the loan and/or seek a foreclosure prevention alternative, Civil Code 2920.7(c)(d). Claimants remedies for violations for this new law include injunctive relief, attorneys fees and costs, Civil Code 2920.7(e). (a) Every Commercial Lease form or Agreement signed after January 1, 2017, must state whether the premises have undergone a CASp inspection, Civil Code 1938(a). (b) If the premises have been inspected and meet all disability access requirements the landlord must give prospective tenants a copy of any CASp inspection certificate and report before the Lease is signed. If the landlord does not give the report to the tenant at least 48 hours before the Lease is signed the tenant can rescind the Lease on the basis of the information in the report within 72 hours after signing the Lease, Civil Code 1938(c). If the tenant did not receive the report before signing the Lease, the landlord must give the tenant a copy of it within 7 days after signing the Lease, Civil Code 1938(d). Scott Souders is a real estate attorney who has practiced real estate law in excess of 40 years in Southern California. 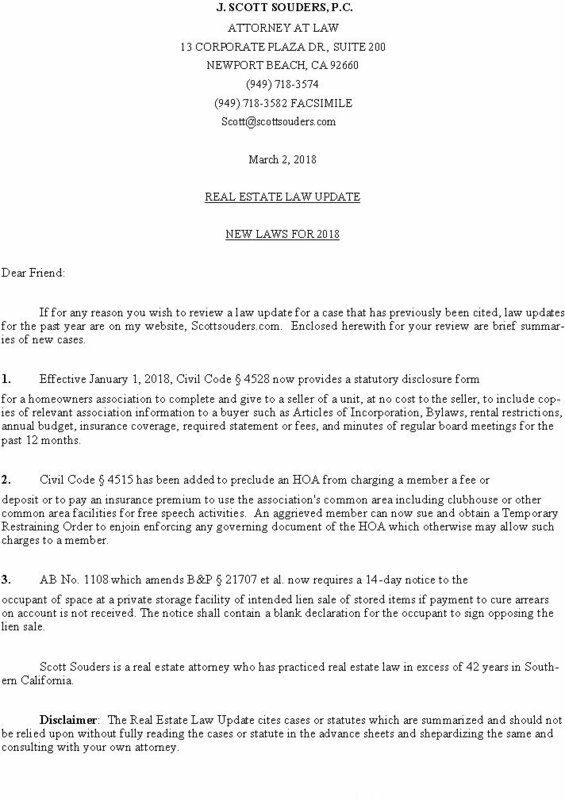 law updates for the past year are on my website, Scottsouders.com. Enclosed herewith for your review are brief summaries of new cases. Injunctive Relief and Nuisance among other causes of action when Munoz, without the HOA approval, installed hardwood floors in his condominium. The condominiums in this building all had carpeting rather than hardwood floors in order to mitigate sound transfer through the floors. a severe dust allergy. The owners claimed she cannot live in an atmosphere that has dust. They argued that the carpets collected dust. Therefore, it was a requirement based upon her disability and health that the hardwood floors be installed. downstairs neighbor further claimed based upon the noise that it was difficult to relax, read book, watch television or sleep. prevented the Munoz’s from installing hardwood floors. The homeowner lost at the trial level and appealed to the Court of Appeal. sound damages. A modification/stipulation of the HOA to the owners to accommodate her claimed disability was to install throw rugs to be placed on 80% of the floors outside of the kitchen and bath areas. The Appellate Court affirmed the Trial Court’s decision by allowing for the modification intermin solution by placing 80% of the area throw rugs. The Appellate Court determined that was not abuse of discretion by the Trial Judge. Comment: Seems like the Munoz’s spent a great deal of oney being forced to comply with rules that were running with the and when they purchased their condominium. The only parties/entities that made out on this case was the condominium association’s attorneys and the Munoz’s attorneys. Appraiser Hired By Lender Owes No Duty to Borrower. The exemption that currently exists for battery powered smoke alarms installed prior to July 1, 2014, expires shortly on July 15, 2015. Battery operated smoke alarms must be replaced with those that contain a sealed battery and is rated to last at least 10 years. All hard wired smoke alarms must comply with provisions that have a label showing the date of instillation and manufacturer. Can be hardwired with a battery backup or solely battery powered, but must contain a nonremovable battery that is rated 10 years. Must display the date the product was manufactured and must have a place to display the date it is installed on the smoke alarm. Hallways leading to bedrooms that are centrally located outside sleeping areas. If mounted on the ceiling should be at least 4 inches from the wall. If mounted on the wall should be 4-12 inches from the ceiling. All of the above mentioned requirements pertain to landlords. In addition, the landlord cannot make the tenant responsible for testing or maintaining the smoke alarm. It is now the landlord’s responsibility. Scott Souders is a real estate attorney who has practiced real estate law in excess of 39 years in Southern California. should not be relied upon without fully reading the cases or statute in the advance sheets and shepardizing the same and consulting with your own attorney. Seller In Order to Close Escrow. Restaurant Can be Held Liable for Failure to Have Sign Warning of Dangerous Condition of Entering Public Highway. In the case of Annocki vs. Peterson Enterprises, LLC, 232 Cal App. 4th 32. Geoffrey’s Restaurant on PCH in Malibu was sued. It’s customer, Terry Turner, left the parking lot at the restaurant and turned onto PCH. The entry onto PCH is on a hill and the view of the highway is slightly impaired when exiting. Rather than turning right with the flow of the traffic to head South, Turner drove across the lanes of traffic and tried to turn left heading North on the other side of the highway. There were paddles in the median of PCH that divided the lanes of traffic. The paddles were installed to prevent Turner from turning left into the flow of traffic and across the lanes heading North. When Turner discovered that the paddles blocked the left hand turn after he had exited onto the highway, he attempted to back up from the highway back onto the premises to get out of the lanes of traffic. However, a motorcyclist came up and over the hill and struck Turner’s car. The motorcyclist died and his parents sued the restaurant claiming that the restaurant had a duty to warn customers of the dangerous conditions of the highway. The superior court judge dismissed the case, claiming the business had no duty to warn customers. The court of appeal reversed the holding, stating that Geoffrey’s Restaurant’s failure to post signs on it’s own parking lot stating customers could only turn right out of the parking lot driveway and that left turns were not possible exposed the public to unreasonable risk of injury. Comment: You would think that if the median on PCH has paddles that prevent motorists from crossing the lanes to turn left that those paddles would be enough notice to the public that it would be dangerous to attempt such a maneuver. Turner’s conduct not only killed an innocent motorcyclist, but now it causes owners to have to post signs on their premises to prevent stupid maneuvers such as what Terry Turner tried to pull off by turning leftagainst traffic. Caregiver Loses Her Case Trying to Take House From Estate. In the case of Jenkins vs. Teegarden, 230 Cal App. 4th 1128, Teegarden is the caregiver for a senior citizen. 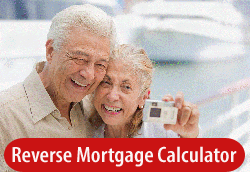 She talks senior citizen into curing the default on the foreclosure of her house. He agrees to sell her house back to her with an oral option. Later, not being able to exercise her oral option, she talks him into building a house on the lot that he owns next door to his house. She will live in that house and continue to take care of him, which she is receiving approximately $10,000.00-$15,000.00 a year for her services. The owner borrows against the house that Teegarden previously owned and builds a house next door to his on his lot. Teegarden puts in $100,000.00 of her own money towards the construction of this house. The house is worth about $500,000.00. As part of Teegarden’s plan, she goes to a stationary store, obtains a Quitclaim Deed, fills out the Quitclaim Deed and has the owner sign the Deed. She records the Deed. However, the Deed has errors. She screwed up on the vesting of title. The owner, individually, did not own the house, but he owned it as trustee of his living trust. She also screwed up on the legal description, which was not accurate. As a result of these errors the title of the property remained in the trust. Approximately four years later the owner dies. The trustee of the owner’s trust files a petition in probate court to declare that the Quitclaim Deed recorded by Teegarden was void as a violation of Probate Code Section 21380. This Probate Code Section states that a donative transfer of significant value of real property to a transferee who is unrelated is invalid unless the deed has either been reviewed by an independent attorney or approved by a court. This is true even if the transferee proves that the deed is not as a result of fraud, menace, duress or undue influence. In this case, the transferee did give consideration. Therefore, it was not a donative transfer. The caregiver argued that she gave the owner consideration for the Quitclaim Deed in that she released the oral option to buy her old home back, she gave the owner $100,000.00 towards construction of the home and she continued to provide care to the owner. Based upon this evidence the trial judge ruled for the caregiver and ruled that the Quitclaim Deed was not void, but was valid. The judge also corrected the errors in the Quitclaim Deed. The court of appeal reversed stating that the Quitclaim Deed was void as a donative transfer. The court of appeal further stated that the Quitclaim Deed was not for adequate consideration. The release of the oral option was worth nothing because the caregiver could never prove that she had the money to buy back the property. The $100,000.00 the caregiver gave to the owner was no benefit to the owner because the property was used by the caregiver who moved into the house. Finally, the care giver was paid $10,000.00-$15,000.00 a year for care. Comment: This is one of the first cases that holds that a donative transfer under 21380 of the Probate Code can also include a Deed for consideration if the consideration is unfair or inadequate. Every year I receive at least one or two phone calls wherein a senior citizen or one their heirs or relatives claims that the senior citizen has been taken advantage of by their caregiver. Financial Elder Abuse cases are more prevalent.